Run! 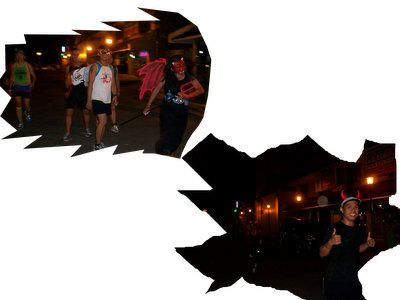 and Keep on Running: It's Halloween Let's Run! Boo? "monsters on the run.,come to our Halloween Run just for fun!" will they "SCREAM" if they found out who's behind them? "When witches go RUNNING,and black masks are seen,the moon laughs and whispers, it is Halloween." Running is hard enough what more if you are wearing a complicated costume? Not for runners though. 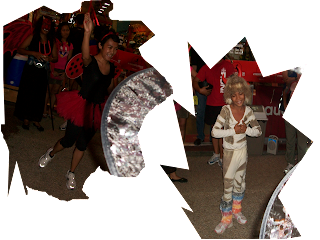 Give them the chance to run in any given day (or night) much more on Halloween and they will run with much gusto! I fancied joining a Halloween costume run this year but my body condition "killjoyly" scratched the plan. I'm on a run /train break (cough aaaw). 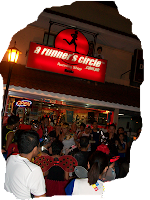 So as not to miss the excitement I went "ghost hunting" and found a bunch of monsters, beauties and cuties doing a spook-tacular costume run in this perfect place/store not so haunted called A Runner's Circle. "monsters and scary faces, Halloween is the time to misbehave"
the host "A Runner's Circle"
Thanks to A Runner's Circle for making running more enjoyable in any given day. Check out their free fun run, running clinic and store items from here. Happy Halloween!